Around this time last year I had an amazing day on the 'Dutch Masters with a Modern Style' workshop run by Sarah Statham of Simply By Arrangement. I don't often give my time to just play with flowers, as I am mainly growing or doing weddings and I am not a spa person. So for a treat, a day for me - and because one should always keep learning - I booked on Sarah's workshop. 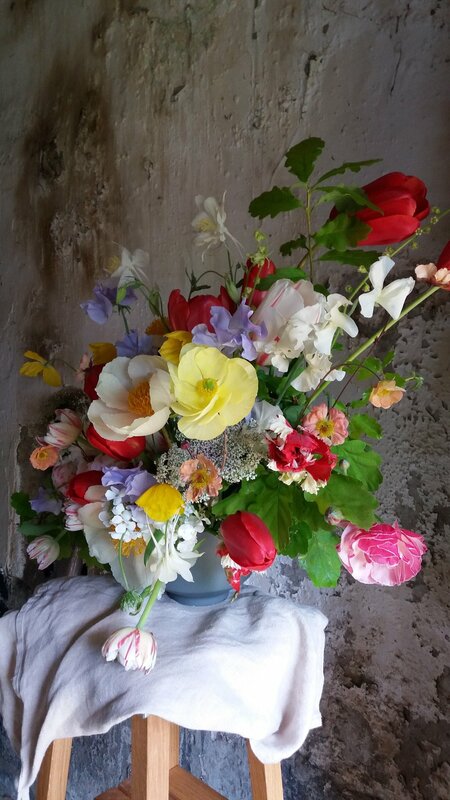 She describes her workshops as a 'feast for the senses, with masses of flowers and food - a perfect day away from the stresses of life'. And it is all true. 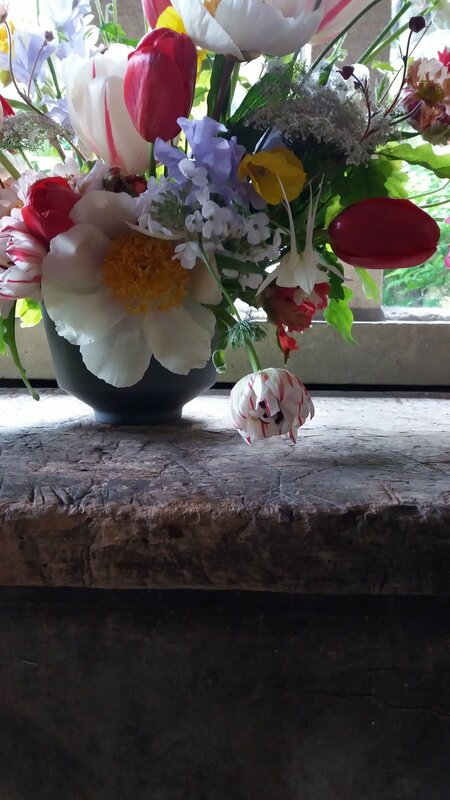 Wonderful food by Mrs B, masses of British flowers by local growers, and additional Dutch flowers if necessary. Plus the chance to 'float' around the garden to select a few little pretties. 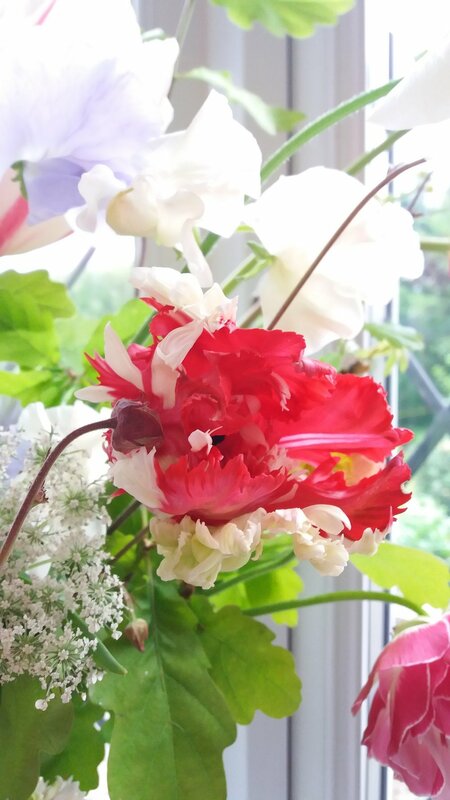 I took along some Tulipa Sky High Scarlet and Tulipa Estella Rynveld, and then had the pick of so many other beautiful blooms to create, with guidance from Sarah, one of my favourite floral arrangements. It brought out my inner Rachel Ruysch, and I still long to paint my arrangement. Oh and we also got a handmade pot from local ceramist Jill Shaddock, and the expert tuition of Ed from Snug Gallery in Hebden Bridge who gave us hints and tips on photographing our creations using our phone. 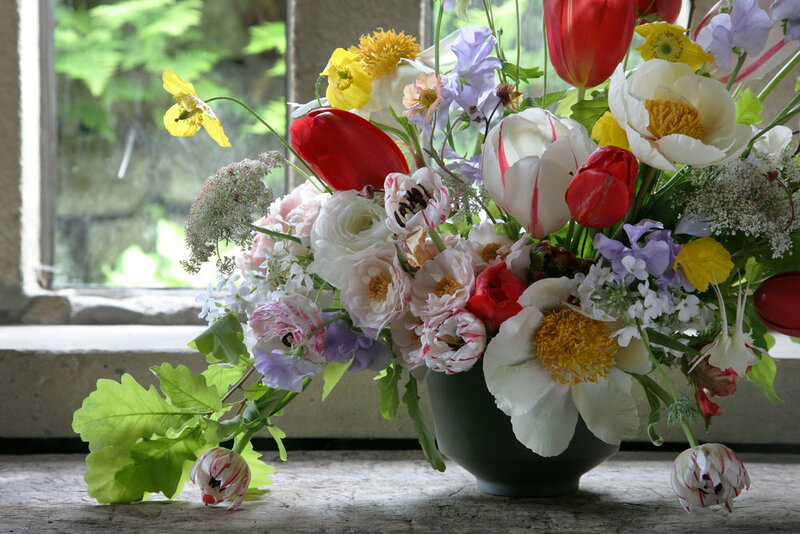 I know that this years Dutch Masters course has already passed but if you ever get chance to go to Sarah's for one of her other workshops then do.